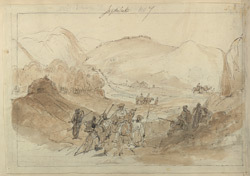 Drawing executed in pen-and-ink and water-colour of soldiers in the Jagdalak Pass, Afghanistan by James Atkinson (1780-1852) dated 1840. Inscribed on the front is: 'Jugduluk'. This is folio 9 verso from an album of 17 drawings of views in Afghanistan from the Kyber Pass to Kabul by Atkinson. In the 19th century Britain, eager to defend the Indian Empire from Russian territorial ambitions, was involved in campaigns in Afghanistan and the North West Frontier Province (Pakistan). During the First Anglo-Afghan War (1839-42) James Atkinson served as Superintending Surgeon to the Army of the Indus, a combined force of British and Indian troops. A talented amateur artist, he took the opportunity to complete many sketches en route which portrayed the mountain passes, rocky gorges and arid plains of the country. The Jagdalak Pass, situated between Kabul and Jalalabad, cuts through the forbidding Hindu Kush Mountain Range and was the scene of bitter conflict during the Afghan campaigns.